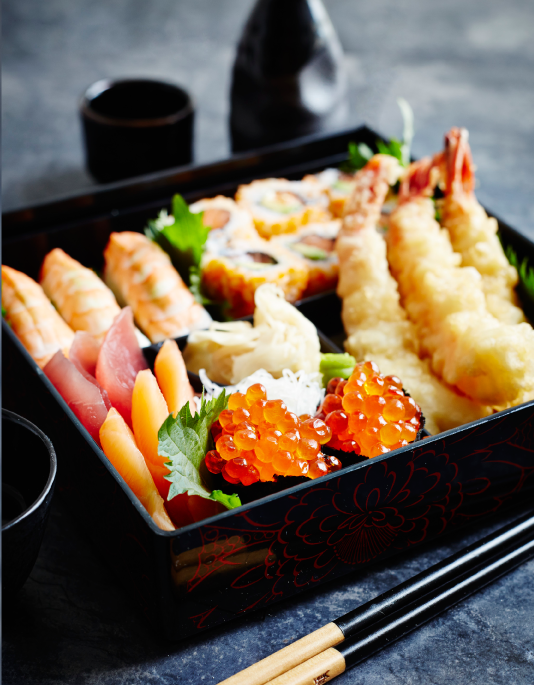 The art of Japanese nibbles beautifully packed into a box – it’s Bento! A packed lunch so elegant that only the Japanese could have invented it, the bento took shape during the prosperous Edo period (1600–1868), as theatregoers and day trippers impressed one another with aesthetically pleasing picnics. Now, no cherry-blossom-watching party or Japanese school sports day is complete without a spread of umami-rich nibbles in compartmentalised boxes, which are unwrapped from decorative furoshiki (wrapping cloths) to a chorus of admiring oohs and aahs. The classic shokado bento in its lidded red-and-black lacquerware box is a staple of Japanese restaurants, typically filled with steamed rice, pickled plums, sashimi (raw fish), battered prawns and cooked meats. Other variations include the makunouchi (‘between-acts’) bento served at theatres, and kawaii (‘cute’) bentos tucked into school bags of little ones (whose mothers may pay good money to learn how to make Hello Kitty out of rice balls). True enthusiasts know that the best boxed lunches are eaten at 170 miles an hour while speeding between cities on the bullet train. Thousands of varieties of takeaway ekiben (station bento) showcase local specialities (sea urchin and salmon roe on Hokkaido; grilled beef tongue in Sendai), turning platform kiosks into foodie hotspots. The art of bento has spread far beyond Japan – something to think about next time you plough grimly through a foil- wrapped cheese sandwich or heat up last night’s leftovers in the office microwave. Try making your own Bento kids packed lunch box with tips from Capture by Lucy. Buy Bento boxes and supplies from Japan Centre. Buy the Just Bento Cookbook for Everyday Lunches to Go. Turn to page 62 of September’s The Simple Things for more Food from Afar. Buy or download now.